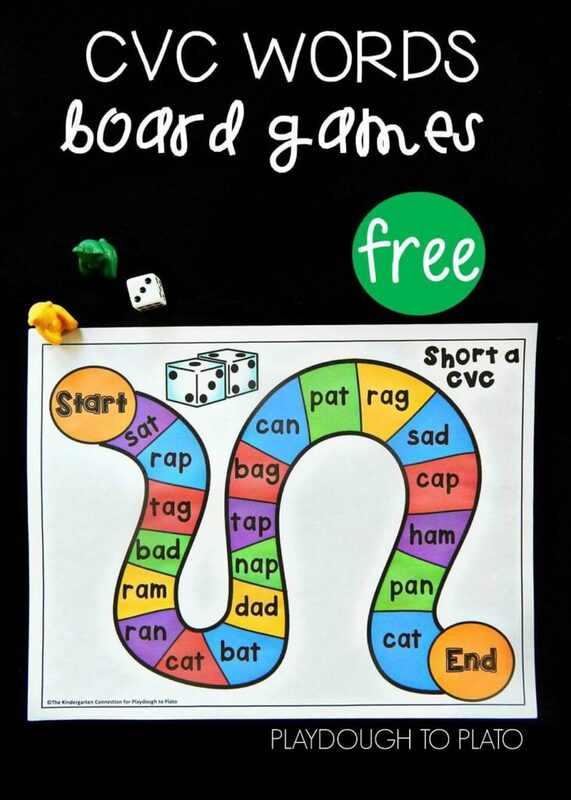 These CVC word board games provide fun practice for children and help them build confidence as readers. 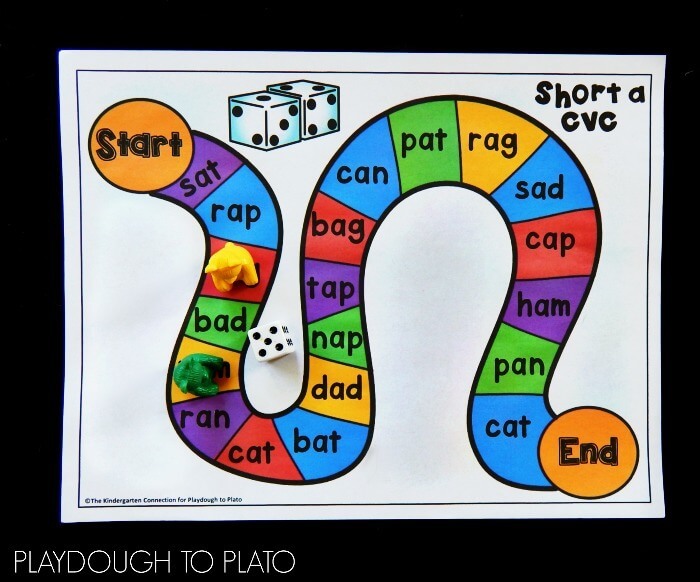 Just print the CVC word board games (below) and get ready for some serious reading excitement. 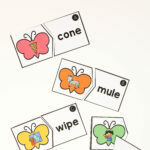 In the early stages of reading, children begin blending sounds together to read CVC (consonant, vowel, consonant) words. New readers can sound out CVC words slowly, one sound at a time and then put them together to form the word. These CVC board games practice words with all 5 of the short vowels (A, E, I, O and U) and are available in color or black and white. For repeated use, I printed them in color and placed them in a sheet protector. You could laminate them instead if you’d like. Kids rolled the die, moved that number of spaces, and read the CVC word they landed on. We kept it simple and took turns rolling and reading and whoever got to the end first was the winner! You could roll again when you read the word correctly. You could play as a team and if someone doesn’t know the word, the group helps. You can use the black and white version for kids to take home. This is a little different because it can be played solo! 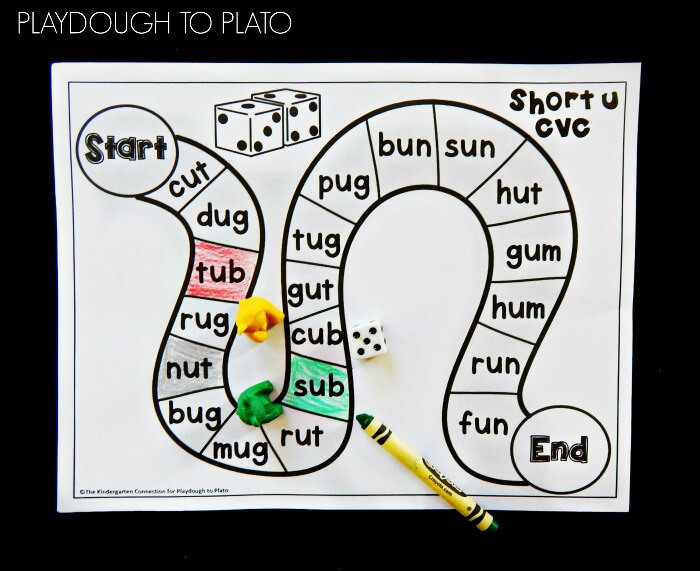 Simply roll, count the spaces, then read and color the word. Kids keep playing until they have colored all of the CVC words. 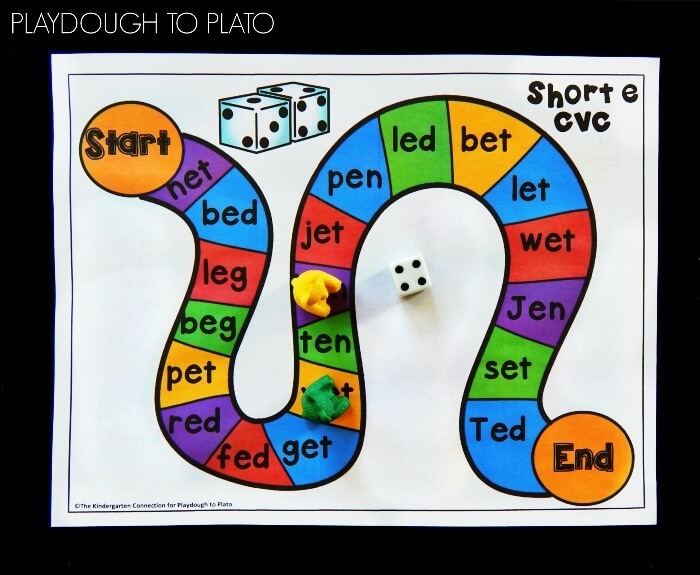 To get some extra practice with CVC words, there are also flashcards in the download that include all the words in the board games! You could use them simply as flashcards, spelling cards, or you can print 2 sets and play card games such as Memory or Go Fish with a partner. 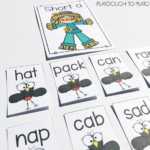 Are you ready to practice reading CVC words? Simply click the blue download button below! Love the free CVC game board and word cards! 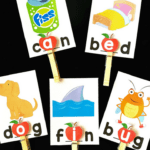 By chance is there any way you can put dots under each letter of the CVC word cards to our students can practice touching underneath the letter to say the sound? We are working on blending these sounds. Thank you! Thanks, Maryann! I hope your students love them as much as we do!